A hub for entrepreneurship, design and creation soon will come to Fishers, thanks in part to a partnership between the City of Fishers and Hamilton Southeastern Schools. On Nov. 15, Mayor Scott Fadness, Hub and Spoke founder David Decker and OnPoint Real Estate Solutions President Travis Tucker announced the Hub and Spoke Design Center, a $14 million, 85,000-square-foot building that includes a showroom, event space, warehouse and makerspace at 106th Street and the soon-to-come Nickel Plate Trail. The 85,000-square-foot Hub and Spoke Design Center will include warehousing, a showroom and events space, tenant space, a makerspace and more. The idea was sparked when Tucker attended the State of the Schools address in March and learned of a joint intitiative between the city and HSE schools to foster unique student education by partnering with local businesses. Besides artisan and design entrepreneurs, Fadness hopes the makerspace will provide a unique educational opportunity for HSE students. Approximately 15,000 square feet of the Hub and Spoke Design Center will be designated to the makerspace area. Decker said lack of skill in the trade industry is one of the drivers of the project. Another goal of the Hub and Spoke Design Center is to help kids enter the workforce earlier. Decker said if someone attends college and doesn’t graduate, or the post-secondary education results in a large amount of debt, that student potentially may be further behind than a student who enters the workforce immediately after high school. Construction is scheduled to begin next spring with an estimated completion date for the end of 2019. 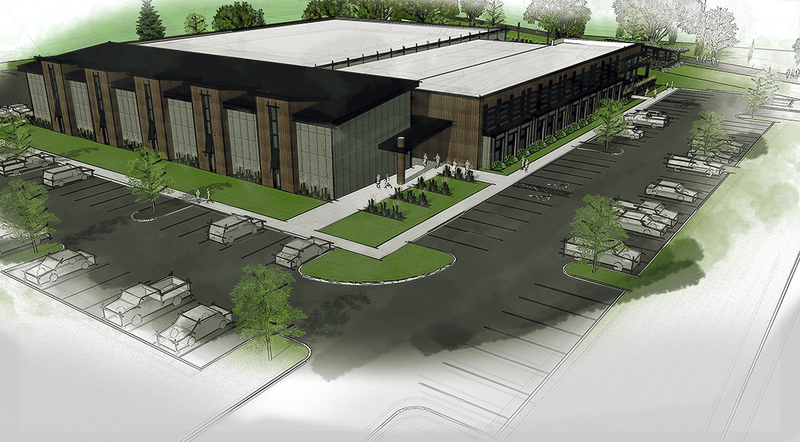 A rendering of what the Hub and Spoke Design Center may look like from a trail view. Although some people may assume the Indiana Arts and Design Center in Carmel and the newly approved Hub and Spoke Design Center in Fishers will be competitors, Hub and Spoke founder David Decker said it isn’t true. Decker said a unique aspect of the Hub and Spoke Design Center is its warehousing space. “Everyone sees the need for (the project) and is fired up,” he said.